Captain Kirk, Mr. Scott, Dr. McCoy, and Uhura are on the homeworld of the Halkans, attempting to negotiate an agreement to mine dilithium from the planet’s surface. 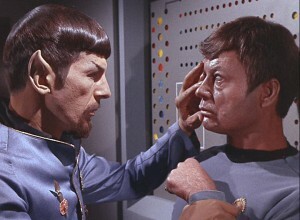 The Halkans, however, are a race that believes in total and absolute peace, and their leader Tharn refuses to grant Starfleet these rights; while the Federation is currently benevolent, “the future is always in question.” Disappointed but hopeful for a change of heart, Kirk asks Spock to beam up the landing party. They appear and are wearing modified uniforms, with gold sashes around their waists. Uhura’s midriff is bare. Spock and the other transporter room officers greet the Captain with a quasi-Heil Hitler salute. 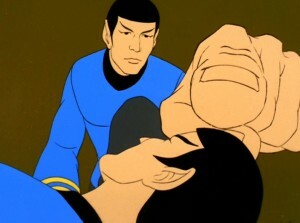 But worst of all…Spock has a beard.